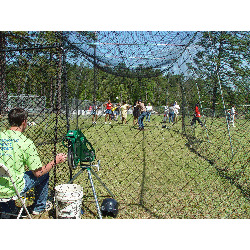 $795 14'Wx15'Hx35'L Kids, teens and adults will love our full -sized batting cage, just like the one at your favorite professional ballpark! Our pitching machine can fire strikes up to 75 mph. Your rental includes a full supply of bats and balls, along with safety helmets for your batters. This can be the hit of your party or event!